Their new up-to-date web site helps celebrate their 45th year as a leading, award-winning Interior Design, Office Planning and Project Management firm. With a new web site developed to promote and rank high in Google listings these folks now have a productive site they can be proud of. Delivering fuel anywhere throughout Canada, Econo Gas now has a new web site to deliver their message! This is a new painting company in Ottawa with professional painters providing interior painting services at very affordable prices. For over a decade CAPCOM Consulting has been a full service, Ottawa website design and website development company. We create customized, easy to use and affordable websites for small to medium size businesses and organizations in Ottawa and area. Our focus is to help Ottawa and area business owners get a world class website at a price they can afford. We do not have offices in Ottawa’s downtown core with a large staff. 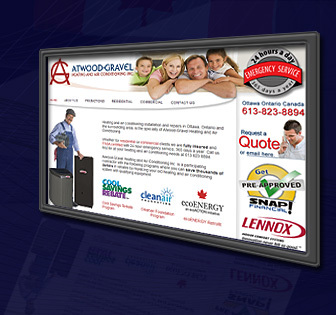 We keep our overhead low, so our prices stay far below larger Ottawa website design companies. You pay for your website, not our rent! We always have time for our clients and you! We’ll ensure you are glad you did. Contact us now for a free consultation at 613 - 825 - 6482. We provide everything you need from conception to creation to maintaining, and updating your website. Affordable Ottawa website designs, and Ottawa website development includes everything need! There are other things we focus on to get you higher in the rankings but these are the main ones. Don't forget you need to think about more than just Google too!